Copyright © William N. Britton. 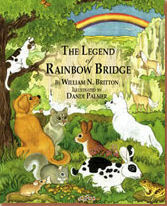 The Legend of Rainbow Bridge - Click to buy book from Amazon. Note - Throughout the internet there are actually several forms (or versions) of the poem above. Many of which are attributed to "anonymous". However, Mr. Britton is the actual author of the original poem (as shown above). Holly was from a three kitten litter from Tempest and the last litter that Tempest ever had. Holly was one of the most social cats I have ever seen and at times, I think, she acted more like a dog. She slept on our bed at night and during the day she would sleep on the chair in our living room with her buddy, Grady (an Italian Greyhound). Whenever I would get a migraine and have to go to bed for rest, it was Holly and Grady who would keep me company during these dark days. On June 28, 2014, Holly became sick with (as of yet) some unknown neurological disorder. During the course of the next week, she would rebound a bit, but would always relapse within a few hours. On July 5, 2014, the difficult decision had to be made to do what was in her best interests as once again she was comatose. My husband and I decided to let her go. Holly, you will always be on my mind and forever in my heart. Love you baby! 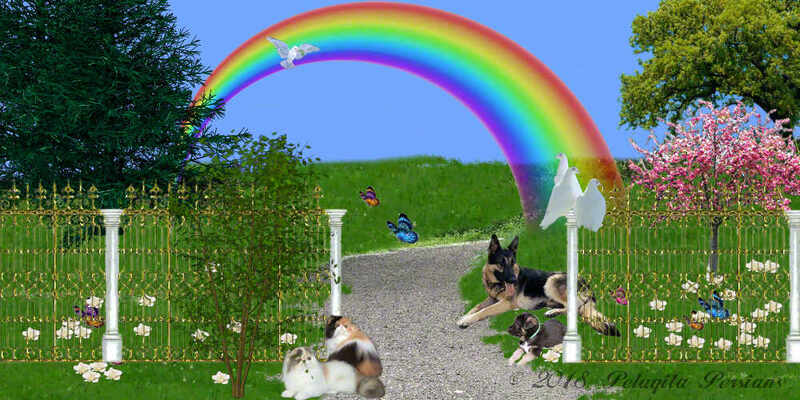 Below are pictures and stories from a few of our "cat" friends who have had their companions cross over the Rainbow Bridge. PLEASE NOTE: None of the cats shown below came from my cattery. Chessie was a wonderful friend and she died on April 13, 2013. She was 15.5 years old and despite serious health problems for the past 5 years was always loving, alert, and engaged. In addition to a serious heart murmur which required medication, Chessie suffered from kidney problems which required hydration on a daily basis. She was always cooperative and compliant. 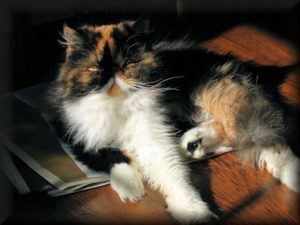 Chessie was a calico Persian with striking markings. Her right front leg was black and the left one was white. 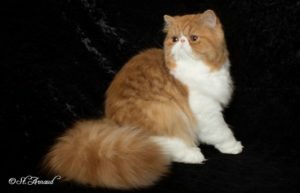 When we first met her she was being groomed by her father-cat and was extremely playful. We adopted her at age 12 weeks and she joined our family immediately. On the first day at her new home I had come down with a bad cold and decided to have Chessie rest with me. She was very attentive and stayed with me for 4-hours. I think this was our bonding experience because from that time on, she clearly favored me over any other person ( much to my wife's chagrin). She was very jealous whenever my wife and I would hug, and she typically would try to separate us by inserting herself between us. It was interesting that she had habits as a kitten which continued through her life (e.g., when drinking water she would immerse her face in the water giving her a very wet face; she had a unique stretch which we named the "double-stretch" meaning she would first extended her two front legs, then pivoted forward to stretch her back legs). Chessie was extremely intelligent. She played hide and seek, chased a small Frisbee and would join us on the deck when we sat outside. She was very aware that she was required to stay on the deck and rarely tested this limit. She loved to join us for dinner and especially loved the Sunday morning newspaper. She loved bedtime and typically would be waiting for me to snuggle when I came to bed. She purred a lot and would stroke my face with her paw in response to me petting her. 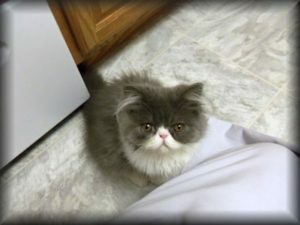 I have never seen a sweeter cat! She knew her name and would come when called (most times). She greeted us upon return home. She traveled with us from Illinois to New York and back on numerous occasions. As you can tell, we really miss her and are thankful for the time we had with this most special friend. Oreo (March 24, 1999 - May 27, 2009) was born to very well pedigreed parents and even related to the famous cat, Zorro, who won international cat contests. He loved to play peak-a-boo under a warm stack of towels just out of the dryer. This love came from when the breeder would dry him with a warm towel after a bath (spoiled little thing). Whenever I had cereal, he came running to lick milk off of my finger. 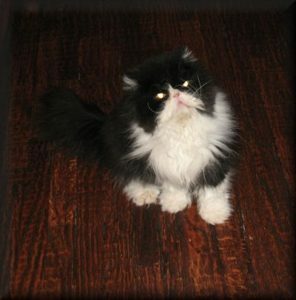 Oreo always had trouble breathing/snorting after we got him. But when we moved to Texas, it cleared up immediately. He must have had allergies in Cincinnati, Ohio. He did so much better in Texas and had more energy...Always gave us a smile. The end came quickly, he had developed cancer all over his body. I am sending two pictures of Oliver, you can decide which one you would like to place in your newsletter next month. You know the story, this is the littermate of Simon that I lost in January 2013 due to FIP. Oliver was a sweet, lovable kitten, he was the one that liked to cuddle out of the two. From the first day that we got Oliver and Simon, Oliver would sleep on a pillow above my head at night. My husband and I got so much joy from watching Oliver and Simon play together when we first got them, we had never had littermates before. Unfortunately, after they were both neutered at 6 months, Oliver got ill shortly after and I had to make the hard decision to euthanize him. It was a shame that he had such a short life of only 7 months. I still cry when I think about it for very long as I truly miss the little guy but luckily we still have Simon. Great idea! I would like to pay tribute to my sweet Mia, who I lost in March 2013. She was 15 yrs old and I had rescued her when she was 12 yrs. her owners who had her since she was a kitten , bought new carpet for their home and decided to dump Mia for fear she would mess up the new carpet! I was able to give her 3 wonderful years. She slept with me and she knew that she was loved. 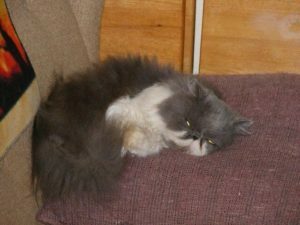 She was a beautiful blue & white bicolor persian. Please consider this book. It is important that a pet owner makes plans as to what will happen to your pets after you die.